Andrea Balcer, 19, left, pleaded guilty Sept. 19, 2018, in Augusta, Maine, to three felony counts under an agreement that caps her sentence at 55 years. Andrea Balcer delivers a statement before being sentenced to 40 years for killing her parents, Tuesday, Dec. 4, 2018, at the Capital Judicial Center in Augusta, Maine. AUGUSTA, Maine — A Winthrop woman who admitted to murdering her parents and the family dog on Halloween two years ago was sentenced Tuesday at the Capital Judicial Center to 40 years in prison. 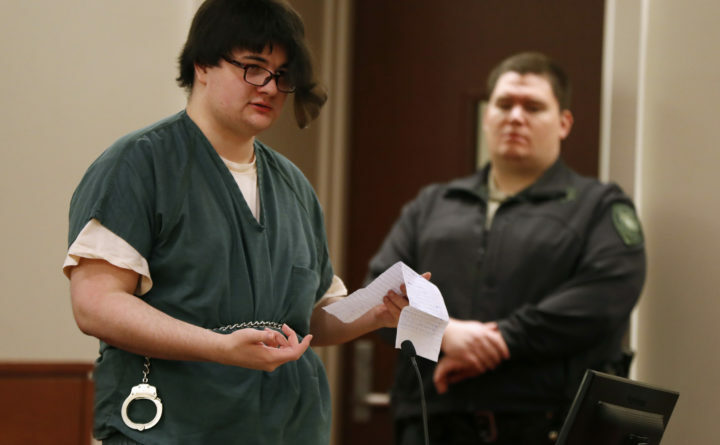 Andrea Balcer, 20, of Winthrop, who is transgender and previously went by Andrew, pleaded guilty in September to two counts of intentional or knowing murder and one count of aggravated cruelty to animals. Balcer’s plea agreement with the Maine attorney general’s office called for the prosecution to recommend a sentence of 55 years in prison. Defense attorney Walter McKee of Augusta urged Superior Court Justice Daniel Billings to impose a lesser sentence, closer to the 25-year mandatory minimum. McKee did not suggest a specific sentence. In interviews with psychologists over the past two years, Balcer has said that she did not believe her parents would be supportive of her identifying as a woman and that triggered the slayings. Balcer, dressed in green jail clothes, on Tuesday told Billings that she would not ask for leniency. Balcer said that there is nothing she could do to explain to family and friends how she feels about what she did. Balcer also said she hopes her “beloved brother Christopher” would be able to “deal with his demons” and forgive her. As friends and family members spoke emotionally about the effect the slayings have had on them, Balcer often broke down in sobs during the 3½ hour sentencing hearing. Some family members referred to Balcer as Andrew during Tuesday’s hearing, while others called her Andrea. Christopher Balcer, now 27 and living in Ohio, asked the judge to show no leniency. Alice Balcer’s older brother, Carl Pierce, 52, of Fairfield asked Billings to protect society from Andrea, whom he described as dangerous. Workers from the Winthrop Veterinary Hospital, where Alice Balcer worked, emotionally described her as a loving, accepting, understanding and generous woman who was devoted to her children. All said they were devastated by the murders and struggled to understand what had happened. Only her maternal grandfather, Arthur Pierce, 83, of Brunswick spoke in support of Balcer. A former school superintendent, Pierce talked about her intelligence and academic achievements. While incarcerated, Balcer earned a high school equivalency diploma. Pierce paid for Balcer’s legal defense with the money intended to send her to the Maine Maritime Academy to study marine biology, McKee said. Andrea Balcer called 911 in the early morning hours of Oct. 31, 2016, to say that she had stabbed her mother and father — Alice and Antonio Balcer, both 47, and the family dog, according to a recording of the call played Tuesday. Balcer spared her older brother’s life. “I snapped,” she told a dispatcher. In an audio interview with police played Tuesday, Balcer confessed that she stabbed her mother repeatedly in the back while she was hugging the then-teenager. Balcer, whose father was awakened by Alice Balcer’s screams, stabbed Antonio Balcer in the kitchen and, finally, the dog because it would not stop barking. During the initial interview with detectives, a portion of which was played Tuesday, Balcer did not talk about being transgender. That information became public at the two-day hearing in October 2017 to determine if Balcer would be tried as an adult. Dr. Debra Baeder, Maine’s chief forensic psychiatrist, testified that Balcer believed her parents would not accept her desire to live life as a woman rather than a man. In one of her sessions with her, Balcer said, “‘Maybe I should be someone else. Maybe I should be a woman,'” the doctor testified. “‘I couldn’t be as flamboyant as I wanted. I couldn’t dress the way I wanted,'” she said Balcer told her about her reported conflict with her parents. Balcer was about six weeks shy of her 18th birthday when she committed the crimes, according to court documents. 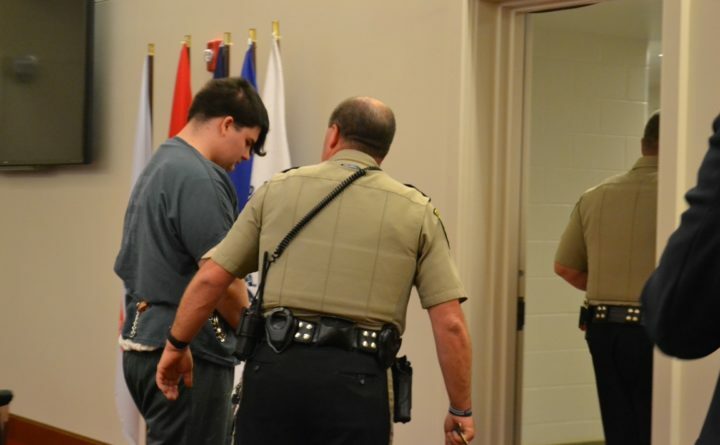 A District Court judge ruled in November 2017 that Balcer should be tried as an adult rather than as a juvenile. Because Balcer was a juvenile when she committed the crimes, she could not be sentenced to life in prison, according to the Maine attorney general’s office. The U.S. Supreme Court has ruled that juveniles convicted of murder are not subject to a life sentence or the death penalty. If Balcer had been 18 when she committed the two murders, she could have been sentenced to life in prison under Maine law. Balcer has been held without bail at the Kennebec County Jail since the ruling that she be tried as an adult was announced. Before that, she was incarcerated at Long Creek Youth Development Center in South Portland.